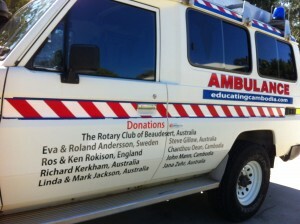 Educating Cambodia » Blog Archive » Our Ambulance – Ready for shipping to our villages in Cambodia! – and a letter from John. 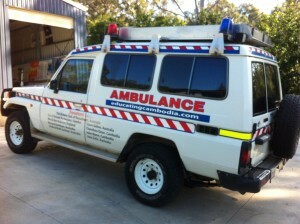 Our Ambulance – Ready for shipping to our villages in Cambodia! – and a letter from John. 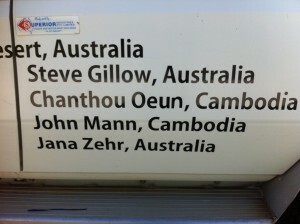 A very big ‘Arkun cherern‘ Khmer for – ‘Thank you very much‘ from everyone in the villages to: The Rotary Club of Beaudesert and all its friends – to Eva and Roland Andersson in Sweden – to Ros and Ken Rokison in England – to Chanthou Oeun in Cambodia for all her organising – to Jana Zehr in Australia – to Steve Gillow in Australia – to Richard Kerkham in Australia – to Linda and Mark Jackson in Australia … and to the many other people who have helped in a hundred different ways with this huge and literally vital project. 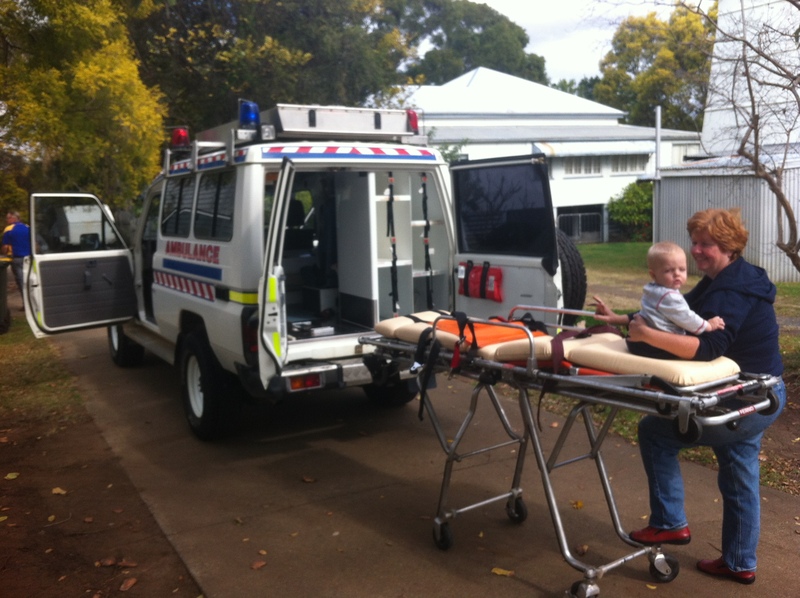 – Our Ambulance is today in Beaudesert, Australia – I am also in Beaudesert. 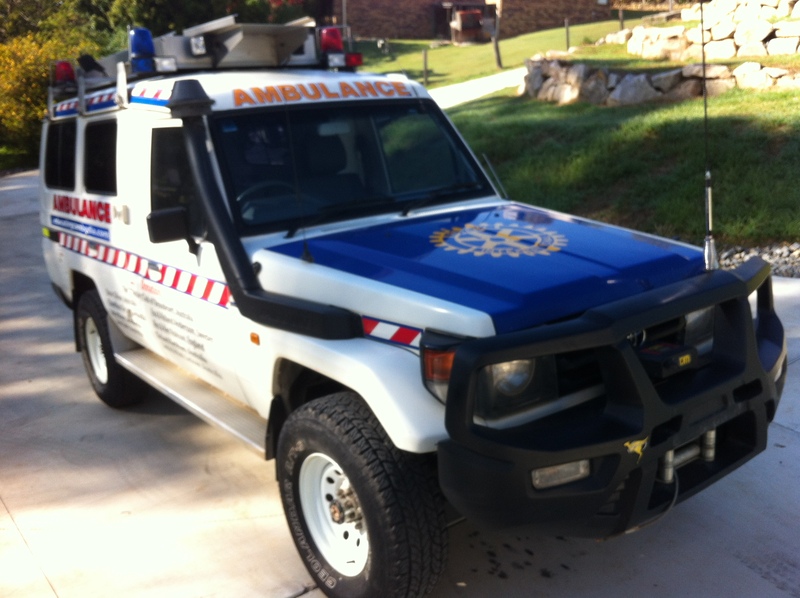 We will ship the ambulance from The Port of Brisbane to The Port of Phnom Penh very soon and I will meet it there, and with some of our village Leaders we will drive it to our remote District – the District of Kamchay Mear in Prey Veng Province. 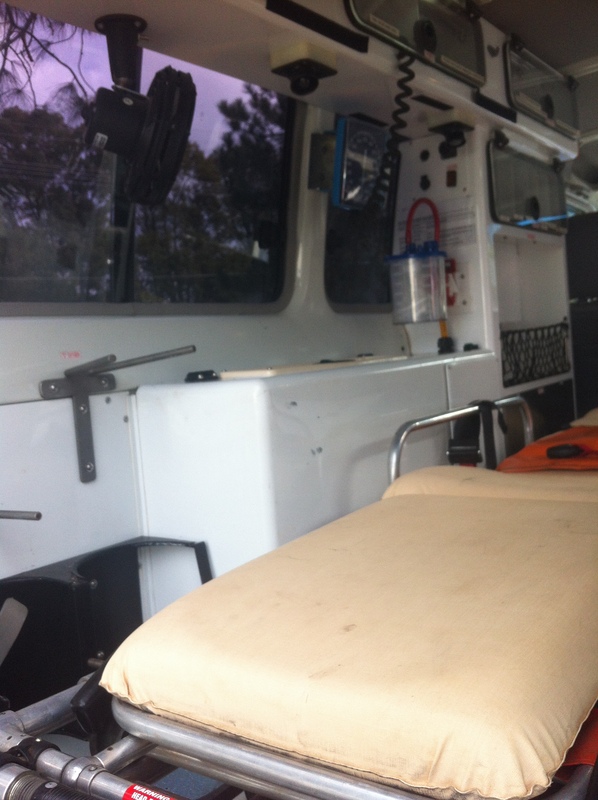 We will make sure its 100% compliant for our conditions and regulations and it will become THE Ambulance for our District – covering all of our villages and liaising with Clinics and distant Hospitals. In return the District will supply us with visiting Doctors at least every week and advice and support for our Clinic at the Chuor Ph’av Schools. We have often written about health, hygiene and nutrition – this ambulance will obviously play a key role. 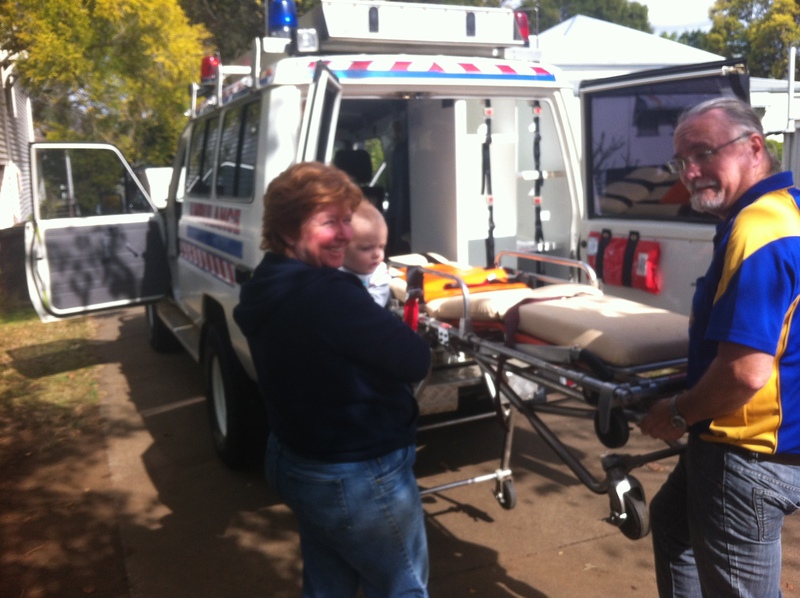 We talk of wanting nurses or student nurses to visit us and volunteer with us – along with The Guesthouse this dream is now a reality – so please contact us to visit and volunteer. Within a few weeks we will officially launch the Guesthouse as the base for visiting our villages and volunteering in our Schools and Health Services. A big thank you from all our Cambodian children for the amazing efforts and work and monetary donations to get our very own ambulance!!!! 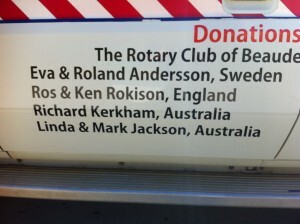 The names of the donors are on both sides of the ambulance. The Ambulance is a Toyota four wheel drive diesel. 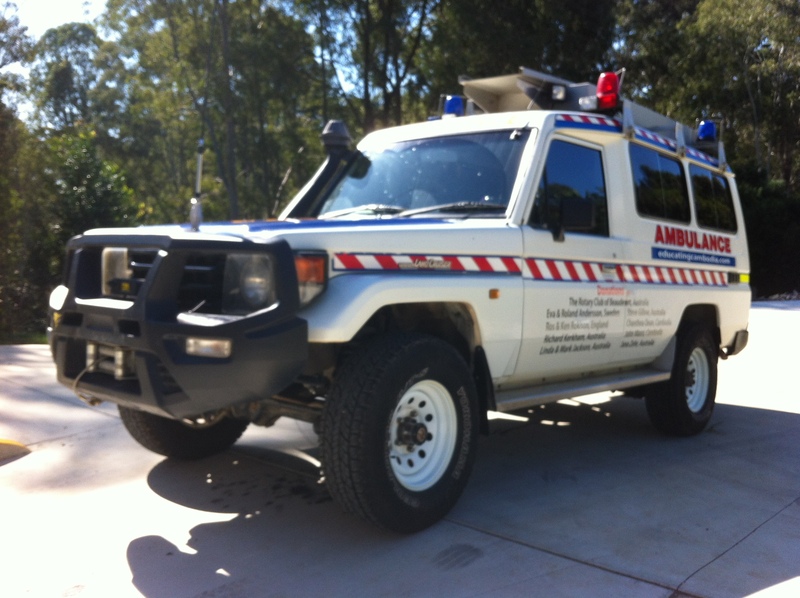 It was essential for our muddy or dusty condtions that the Ambulance was a strong four wheel drive – and it is. 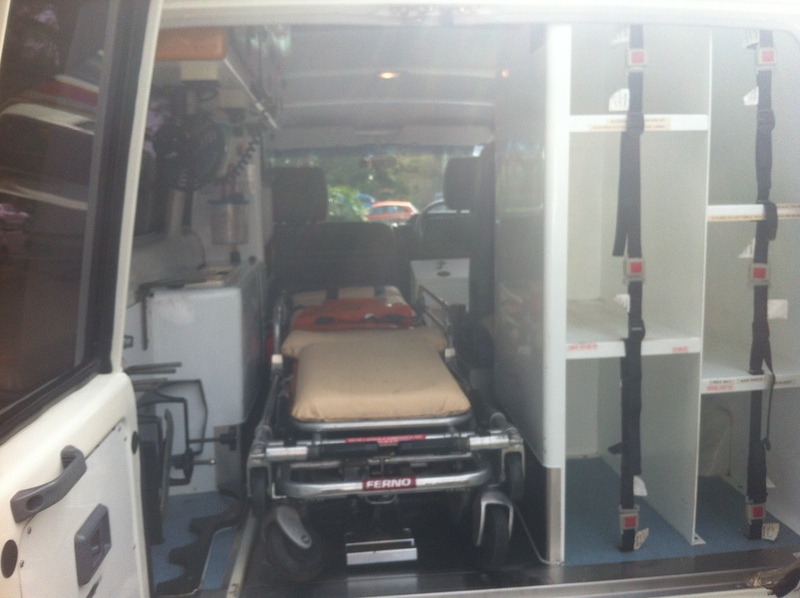 In Cambodia we will need such things as paramedic medicines, bandages etc, Oxygen, and a number of pieces of Paramedic/Doctors equipment but otherwise as you can see from the photos the Ambulance is complete. The last four photos were taken last week -before our sign writing was done – the day we drove the ambulance from Brisbane to Beaudesert. 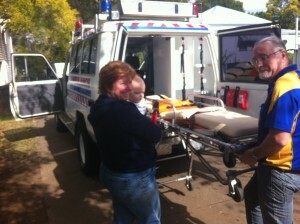 Linda and Mark Jackson with their grandson. 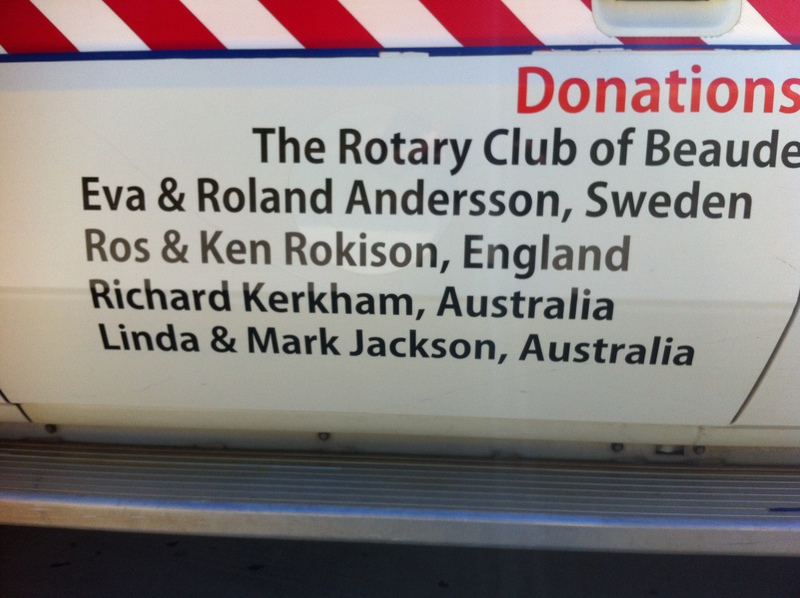 As you can see from the signwriting, Linda and Mark are two of our wonderful Donors…..
Now to pack the Ambulance into a container and get it The Port of Brisbane. I return to Cambodia on August 16 and will meet the container ship in Phnom Penh. All the school equipment you can imagine – Exercise books, Small backboards, large classroom blackboards, text books for 4 subjects for all our children.. desks need replacing (we make our own).. all buildings need maintaining and painting… Uniforms… As you may know it is far cheaper to buy ALL these things within Cambodia – we make what we can – we can buy exercise books in Cambodia much cheaper than say your postage – similarly Cambodia makes robust school uniforms. We accept donated uniforms for general wear in the villages and again they tend to be robust and very welcome. We need to buy in Cambodia, hospital (Clinic) medicines – they are inexpensive in Cambodia BUT we need money to buy them. Like every other school, hospital etc in Cambodia that encourages volunteers – we will charge people to volunteer and to stay in our Guesthouse but it will probably be cheaper than most. We offer to you an area which is more remote than almost all others in Cambodia and desperately poor and heavily populated…..
….the opportunities for you or any University student you may know or student or indeed someone on holiday or on a Gap year to be part of the future of the lives of thousands of children are almost unlimited. 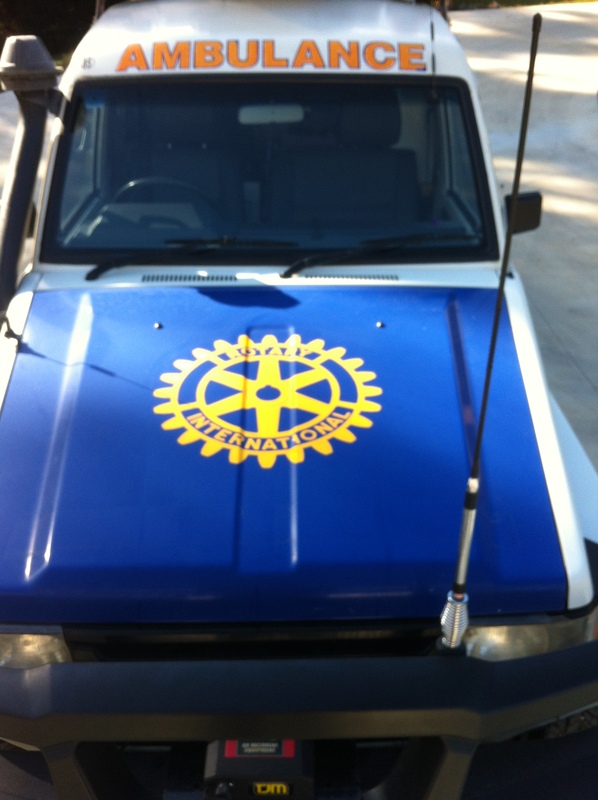 Maybe you want a ‘sea change’ or are actually retired – contact me, John, or anyone at The Rotary Club of Beaudesert in Australia for advice. 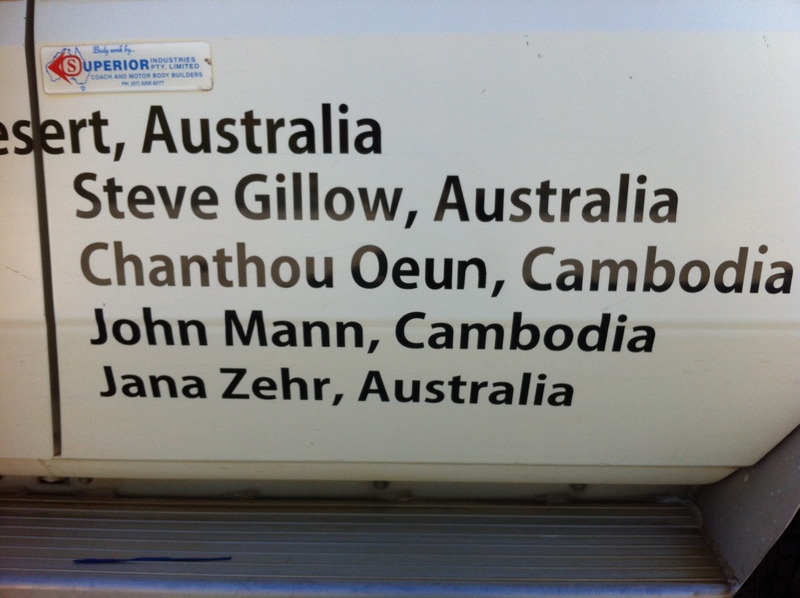 This is the first letter clearly stating that the Guesthouse is ready for business – not only volunteering – also just being part of a Cambodian village! – there will be more of a BIG launch soon. 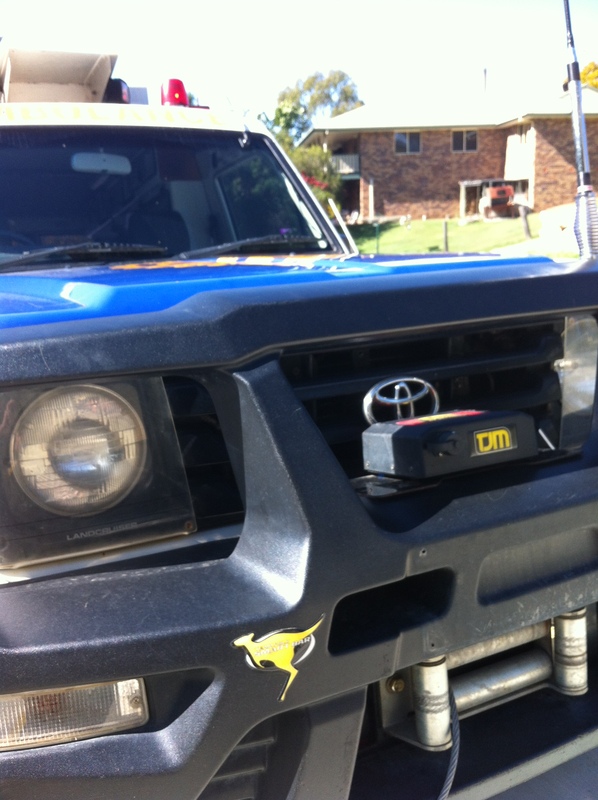 We NEED money – please.. from John on behalf of all the children and all the families….. AND lastly today…. ………..I’ve most certainly not forgotten Soit, the girl we ‘rescued’ back to School (scroll down for the story so far with Soit) – more on Soit soon. John.